The Nile Basin, like any other part of the world experiences extreme events including droughts, floods, landslides, heat waves, e.t.c. The Equatorial lakes region and the Blue Nile including Khartoum experience flooding. The Darthmouth Flood Observatory had compiled an archive of the flooding events in the world; the “Global Flood Hazard Frequency and Distribution” and can be referred to for this information. In this atlas, we present the drought severity as a measure of the average length of drought times the dryness of the droughts from 1901 to 2008 as presented by aqueduct from Sheffield and Wood. Drought is defined as a contiguous period when soil moisture remains below the 20th percentile. Length is measured in month and dryness is the average number of percentage points by which soil moisture drops below the 20th percentile. The flood risk (estimate) map has also been presented clearly indicating areas which are at high risk of flooding with in the Nile basin. The flood risk index ranges from 1 (low) to 5 (extreme) as seen in the map. This product was designed by UNEP/ GRID-Europe for the Global Assessment Report on Risk Reduction (GAR) and was modeled using global data. In Kenya, high inter-annual and intra-annual rainfall variability results in frequent and severe droughts and floods, negatively affecting the country’s economic performance. 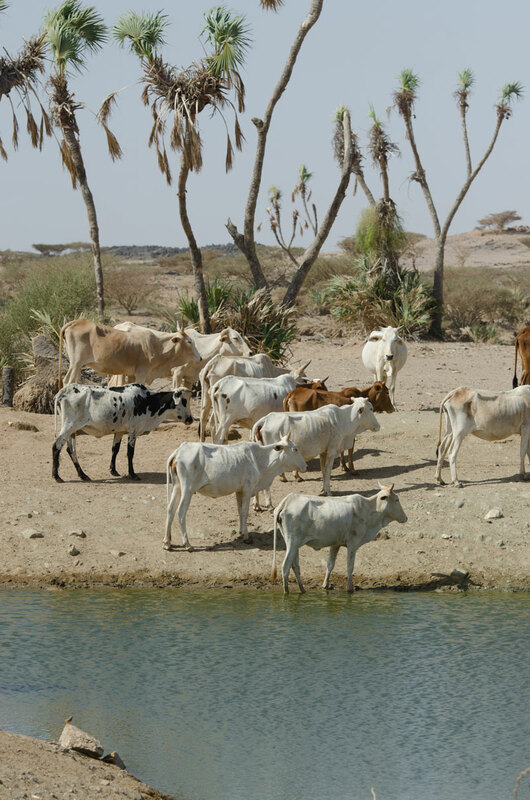 Agriculture and animal husbandry, which together account for 28% of Kenya’s national GDP and employ 70% of the total population, are particularly sensitive to climatic variations and have been adversely affected by the frequent occurrence of water shocks in recent years. Kenya’s droughts can have devastating consequences. Arid and semi-arid lands (ASAL) account for 80% of Kenya’s land area, making the country poorly endowed with potential for rain-fed agriculture given the hydrologic variability that Kenya experiences. Since 2007, Kenya has suffered from two consecutive years of below average rains in most of the country, leading to one of the worst droughts in a decade. The devastating consequences included widespread famine as a result of severely depressed food production, with maize production alone down by 50% and up to 10 million people in need of food aid. The drought from 2007-2009 left Nairobi without water for a period of three weeks in November 2009. Climate variability negatively impacts national GDP and human development in Kenya. The World Bank estimated in 2004 that the losses from climate variability average about 2.4% of GDP per year with a further 0.5% loss from water resources degradation, constituting a serious impact on the country’s competitiveness. For example, during the back-to-back floods (1997-98) drought (1998-2000) between 1997 and 2000, the World Bank estimated that water-related events caused GDP losses of 11%, 16%, and 16%, respectively, for each of the three years. Based on the GDP in those years, this is equivalent to an almost US$ 5 billion loss over those three years. Consequences included widespread famine as a result of severely depressed food production with millions of people in need of food aid, load shedding and extensive power rationing as a result of a near-halving of hydropower generation, and a decline in economic activities of all sectors (World Bank 2004a). Heavy dependence on hydropower for electricity means that Kenya’s economy is especially vulnerable to hydrologic variability. The droughts of 1999-2000 and 2007-2009 clearly illustrated this, when hydropower generation fell by almost half, resulting in massive load shedding, reliance on expensive emergency diesel, and large economic losses. The use of emergency diesel since 2006 has reached 14% of total generation (World Bank 2010c). Future growth will be dependent on better controlling existing hydrological variability, and putting in place policies and infrastructure to hedge against future climate uncertainty. Sudan and South Sudan like other countries of the Sahel, have long suffered from lengthy, devastating droughts. The most severe droughts of recent decades occurred in 1980–1984, 1989, 1990, 1997 and 2000, causing widespread population displacement and famine. In addition, floods in Sudan cause extensive damage, especially around the Nile and its main tributary, the Blue Nile. Severe floods on the latter river in 1988 and 1998 caused property losses estimated at hundreds of millions of dollars. Flooding of the Nile proper in 2007 affected over 500,000 people and destroyed thousands of homes (WHO, 2008a). Seasonal rivers can also cause serious flood damage. In 2003, for example, heavy flooding along the Gash River affected 79% of the city of Kassala, leaving 80% of the population homeless, and inflicted heavy losses on agriculture in the region (NASA, 2008).